Starting university or coming back to the classroom after a summer break? 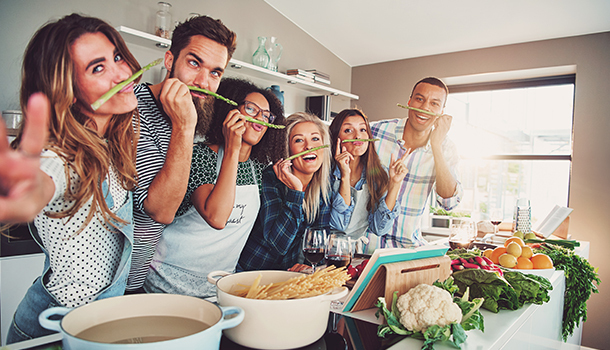 With the help of our personal experience of living and dining in Prague, we’ve assembled this collection of simple recipes for UNYP students that will help them to create a healthier school-week menu and save some money. These five recipes consist of simple ingredients, do not require fancy kitchen appliances, and are easy to prepare in a small kitchen. Of course, you can buy watermelons in Prague throughout the whole year, but they are a lot cheaper in September. Watermelon and lettuce are one of the most refreshing combos of all time. Throw in some feta cheese, artichoke hearts in oil, Italian herbs mix, Schwarzwald ham if you like, then toss it all with a very simple vinaigrette (Olive oil and balsamic vinegar), and you've got yourself a great salad to celebrate the beginning of the new semester! Leave out the ham for a vegetarian option. Tip: Sometimes Tesco has excellent discounts on preserved artichokes. Do you have some artichoke hearts in oil left? Great! Say hello to your new favorite one-pot meal. Defreeze, the shrimp in your fridge overnight, toss it with fresh parmesan cheese and hot pasta, throw in some chopped artichokes. Add the lemon juice before serving. Tip: M&S has a great selection of items available at a discount, so you can buy frozen pre-cooked shrimps and save money! This salad is great for three reasons, it tastes good, takes literally 10 minutes to make, and it is cheap. You can get all the ingredients at your local Vietnamese convenience store, and it still will be good. Throw all the ingredients in a large mixing bowl (don't forget to wash the veggies) and stir delicately until well combined. Serve immediately! For this soup, you will need an immersion blender, but don't worry, you can get a cheap one from Datart, Tesco, or Alza. This handheld kitchen gadget can blend directly into your mixing bowl, so you will be able to quickly prepare healthy snacks like smoothies, hummus, and various pureed soups! This soup is perfect for a cold weather and is easy to make. Throw the turkey liver and vegetables into a big pot, add the water and herbs, simmer 20 minutes. Blend with a little cream, and you’re done. Use 1 Knorr Vegetable Bouillon Cube instead of the chicken broth or turkey liver to keep your soup vegetarian. Cooking time ≈ under 35min. All you need for this omelet is two eggs, cheddar cheese, and some mushrooms. After a busy day at school followed by work on a group project, the last thing you want to do when you get home is spending another 45 minutes in the kitchen making dinner. Before going to grab a burrito, consider having breakfast for dinner – a quick, affordable and healthy option. Tip: Omelettes are highly adaptable. You can use whatever you have left over in your refrigerator: different types of cheese and mushrooms, bacon, smoked or fresh salmon, fresh herbs and vegetables, canned olives, sundried tomatoes – the options are countless!